This article was written at the suggestion of Custom Retailer for their October 2003 issue. A previous article had implied that room acoustics could be fixed with expensive equalizers. Here it is explained why that is not possible due to the room fighting back and canceling incremental boosts in sound. An acoustically correct room will allow the electronics to its job properly. Why can't you correct room acoustics with electronics? Use of sophisticated (and expensive) equalization to attempt room correction made the rounds of sound reinforcement companies and recording studios in the sixties and seventies. It’s now back (times five or more ) in home theater rooms. While equalization can make a good system sound even better in a good room, it does not re-write the laws of physics. The room is an active environment. It will fight back in what we’ll call an acoustic “Zero Sum” game: increasing the power of the absent frequency also increases the level of the out-of-phase room reflection, perpetuating the “null” in the room. It may even be possible broaden it. Remember if the sum of the +3dB SPL original and –3 dB SPL reflection equals zero, so too will adding 3 dB for a + 6 dB original SPL and – 6 dB reflection SPL sum to zero. This can be demonstrated effectively with a simple science experiment: Using a single driver loudspeaker, a single frequency oscillator, and an amplifier, feed a 1000 Hz tone to the speaker through the amplifier to achieve a comfortable listening level. Reposition the speaker to face a hard, flat surface approximately 6-3/4 inches away. The sound will all but disappear. Click Here to see a video demonstration of this experiment. 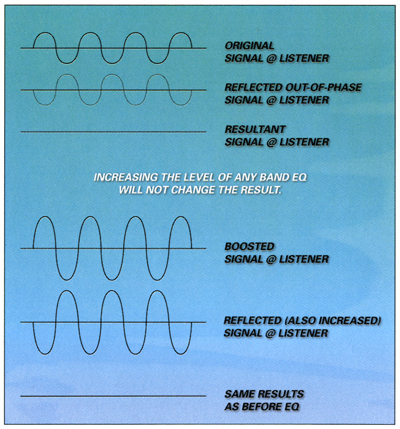 Increasing the source signal level will always cause a corresponding increase in the reflected signal level. In practice, the reflected signal is going to be slightly less and some sound will be heard as signal strength will diminish over distance and absorption. Footnote: Sound travels at approximately 1130 feet per second in air. The wavelength of 1000 Hz is 1130 feet divided by 1000 Hz equals 1.13 feet. Half wavelength is 1.13 feet, which divided by 2 times 12 inches per foot equals 6.78 inches. This calculation will vary slightly for temperature, pressure (altitude) and humidity conditions. Haven’t we passed this way before? During the days of increasing playback channels (mono, stereo, quad) and increasing recording tracks (mono, two track, three track, four track, eight track, twelve track, sixteen track, twenty four track) there was also an increasing awareness of acoustics. Why did the mix sound different at home or in the car not to mention in the next studio? The authors have seen rooms vary 12 dB within the same facility with mixes being all bass or no bass depending upon the room in which they started. When these rooms were corrected with equalization, it typically covered only the mixing engineer’s position or “sweet spot”. Some complained of having to wear a neck brace for fear of falling out of the sweet spot. Of course, the producer, needing to hear the same mix would literally be in the engineer’s lap, and, if the artist and musicians came in to listen, not only would they not hear the “real” mix, they changed the acoustics of the room by being there. Adding or subtracting by equalizing induces phase shift and “ringing” due to deteriorating quality. The equalization curve is bell shaped. Increasing “EQ” broadens the effect to the nearby frequencies as well as the offending one, creating a situation requiring further correction. A narrow “high Q” equalizer may overcome this but introduce its own problems such as phase shift. An equalized boost or cut doesn’t change the resonance of the room, it can only “correct” an idealized sweet spot. With the new range of room equalizers averaging around $10,000 the serious audiophile is wise to consider as little as one-third of that amount to acoustically treat the room. A two-inch panel of 7 pound per cubic foot fiberglass will effectively eliminate reflections above 500 Hz and also reduce the problems by 45 to 75 percent in the two octaves below that point. It will allow the “upscale” equalizer to do its job (or possibly eliminate the need for it). The sweet spot will be widened. What is the ideal room? We often read about the “ideal” room. Ideal would seem to imply a unique right way of doing something. However, there are several ideal rooms. The harmonic is least desirable because of its coincident reinforcement of normal room modes resulting in a series of tones. To refute this, all one has to do is enter the room to alter its acoustic properties, add more furniture, etc. Conclusion: It is unfair to judge any piece of audio gear in a room that fights back. Fixing a room with an equalizer is only one of many audio myths. Correct the acoustics first and all of the equipment, including the equalizer, will have a chance to live up to its published potential. Nick Colleran is a principal in Acoustics First Corporation and a former president of the Society of Professional Audio Recording Services (SPARS). John Gardner is an acoustical consultant who has designed and built professional recording and theatrical facilities throughout the world.